Hearts defeat city rivals Hibernian 5-1 with Barr, Skacel (2), McGowan and Grainger scoring. Hearts won the William Hill Scottish Cup with a commanding 5-1 victory over their fiercest rivals as Hibernian's century-plus wait to lift the trophy was extended. 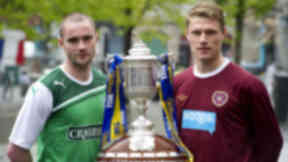 In the first all-Edinburgh Scottish Cup final since 1896, Darren Barr and Rudi Skacel put Hearts 2-0 ahead before James McPake pulled one back, but within four minutes of the restart Hibs were reeling. Danny Grainger converted a penalty conceded by Pa Kujabi, who was sent off for a second bookable offence, and Ryan McGowan added a fourth before Skacel struck a fifth as Hearts extended their unbeaten run to 11 games against Hibs, who remain without a Scottish Cup win since 1902. Hibs suffered further strife when manager Pat Fenlon was sent to the stand late on for gesturing to the Hearts fans, who had been singing his name. Hearts were unbeaten in 10 derby fixtures prior to the final, with Hibs last victorious in May 2009, and both sides of Edinburgh travelled west to Hampden eager to claim the ultimate bragging rights. Perhaps unsurprisingly it was a nervous opening with neither side able to fashion together a meaningful sequence of possession. Playing in what is likely to be his final match for Hearts after being told his contract will not be renewed, midfielder Ian Black clattered through the back of Griffiths but avoided a booking. The first half chance after came after 12 minutes and fell for Hearts, but Rudi Skacel could not get enough purchase on a header from Andrew Driver's cross. After 14 minutes Hearts were ahead when Hibs failed to clear a Danny Grainger corner. Ryan McGowan headed down and turned to shoot and the ball broke for Darren Barr, with Pa Kujabi playing him onside, and the midfielder prodded in his first Hearts goal. Kujabi was then booked for a foul on Suso Santana. McPake won an aerial challenge from Griffiths' free-kick, but the ball went behind O'Connor, who went to ground more in hope than expectation under Grainger's challenge. Soon Hearts were celebrating once more as Black found Skacel on the edge of the area. The Czech Republic forward was given space by McPake to turn and fired a shot off the Hibs skipper and into the far corner beyond Mark Brown. It was top-scorer Skacel's 17th of the season. Hibs' chance for a quick reply fell to their top scorer, but O'Connor could only blast over from close range from Kujabi's cross. Hearts continued to look the more threatening and a Driver cross from the left found Santana, who took a touch before shooting past Brown, but McPake was on the line to clear. Barr shot straight at Brown soon after and an acrobatic Griffiths effort at the other end was blocked by Grainger. Four minutes before the interval Hibs claimed a lifeline when Soares crossed and McPake, up for a corner, turned the ball in from close range. Hibs made a change with winger Ivan Sproule on for Claros, but they could not find a leveller before the interval. The second half got off to a dreadful start as Kujabi was shown a second yellow card 40 seconds in when he was adjudged to have pulled back Santana, with a penalty awarded even though the contact appeared to take place outside the box. Grainger took the penalty and sent Brown the wrong way to restore the two-goal lead. It was the former St Johnstone left-back's first goal for Hearts. Two minutes later it was four. Grainger's cross found Skacel whose shot was flicked on by Elliott and McGowan bundled the ball in. Marius Zaliukas headed wide as Hearts pushed forward again. O'Connor departed for Eoin Doyle as Hibs boss Pat Fenlon made his second change in an attempt to spark a response. On a rare foray forward, Doyle found Griffiths, whose shot deflected off Andy Webster for a corner which came to nothing. Hearts were content to keep possession, while their supporters began to gloat. Barr headed wide from a corner as Hearts continued to dominate territory and possession. The agony continued for Hibs, whose fans began heading for home when Skacel slalomed through attempted tackles from Isaiah Osbourne and Soares before shooting through McPake and into the bottom corner. It was the 18th of the season for Skacel, who is in his second spell with Hearts after leaving following the 2006 Scottish Cup success. Beattie came on for the final 15 minutes, Elliott shot over and Webster headed off target from a corner as Hearts attempted to twist the knife further. With four minutes remaining, Black left the field to an ovation on his final Hearts appearance. Hibs boss Pat Fenlon was sent to the stand by Thomson in the final moments after gesturing to the Hearts fans who had been singing his name. Fenlon had to be persuaded to depart by the police before the referee called time on the contest, leaving Hearts to celebrate as Hibs protested to Thomson, led by McPake.